Heat dutch oven to about 375 degrees for Frying. Cut bacon into small pieces and fry until well done. Remove stem and seeds from jalapenos and dice them into small pieces. Reduce heat under the dutch oven to about 300 degrees. Add onion and jalapenos, and stir for 5 minutes. Add undrained can of tomatoes, and stir for 10 minutes. Crack eggs over cheese, distributing them evenly. Break the yolks, if preferred. 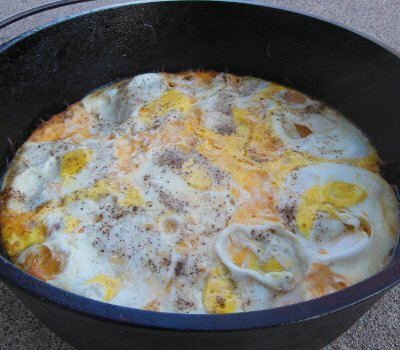 Put lid on dutch oven and move some of the heat to the lid to Bake at about 350 degrees for about 15 minutes, until eggs are firm. When eggs are firm, lay a stack of tortillas on eggs. Replace lid and cook for another 5 minutes until tortillas are warm. 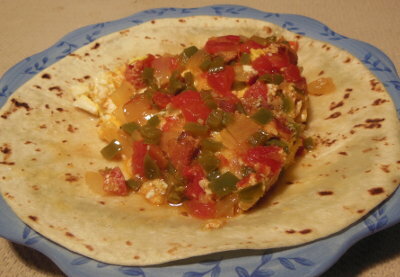 Place a tortilla on a plate and scoop about 1 egg plus sauce from the dutch oven. Flip the egg onto the tortilla, so the sauce is on top. Let me know how you enjoyed your Huevos Rancheros!